A solar wind gust flowing from the indicated coronal hole could hit Earth's magnetic field on Feb. 18th. Image credit: SOHO Extreme UV Telescope. AURORA WATCH: Later today or tomorrow, Earth will pass through a solar wind stream spewing from a coronal hole on the sun. Sky watchers in Alaska, Canada and Scandinavia should be alert for auroras. SUNSPOTS: Magnetic fields around sunspot 735 have been twisting, stretching and growing more complicated since the beginning of the week. If the trend continues, there could be a magnetic eruption--in other words, a solar flare. NOAA forecasters estimate a 15% chance of an M-class flare during the next 24 hours. HAPPY BIRTHDAY, GALILEO: On February 15, 1564, Galileo Galilei was born in Pisa, Italy. If he were alive today he would be 441 years old. Galileo is an important person in the history of space weather. Contrary to popular belief, he didn't discover sunspots, but he was one of the first to observe them using a telescope. Now we know what sunspots really are: magnetic islands. Sunspots consist of magnetic force-fields poking through the sun's surface from below. Sometimes these magnetic fields erupt, producing a solar flare. With a temperature of "only" a few thousand degrees C, sunspots are cooler than their surroundings and, thus, they appear dark. 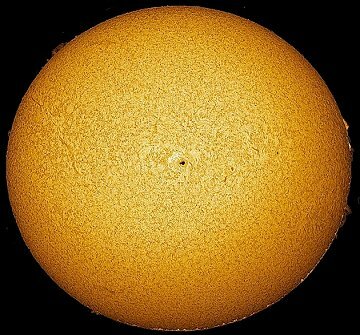 Sunspots are as big as planets. You are visitor number 33061224 since January 2000.